One of the NBA's biggest surprises this season has been the Charlotte Hornets, who have stormed to a 5-1 record over the first two weeks. The team will host the Raptors in what will be the most expensive game of the week on Friday. The Warriors appear on this week's list twice when they welcome the Mavericks and Suns to Oracle Arena this week. The Knicks will play in two of this week's top games when they travel to Toronto on Saturday and host the crosstown Nets at Madison Square Garden on Wednesday. With the Raptors headed to Spectrum Center for a Friday night game, the average resale price for Hornets tickets on TicketIQ is now $736. For those just looking to get in the cheapest tickets start from $17 each. The Raptors own a 4-2 record entering the week and set to face the Thunder on the road before traveling to Charlotte. After setting the NBA record for most three-point field goals made in an NBA game on Monday, Steph Curry and the Warriors will remain at Oracle Arena to host the Mavericks on Wednesday. It will serve as the second most expensive game in the NBA this week, with Warriors tickets at Oracle Arena averaging $329 and the get-in price starting from $51. One day prior to making their trip to Charlotte, the Raptors will host the Knicks at Air Canada Centre. The early-season matchup is generating big demand up north, with Raptors tickets on the secondary market averaging $264 and the cheapest tickets listed from $58 each. The Knicks begin the week at 2-4 on the season and will hope to return to the win column against the Nets on Wednesday night after falling to the Jazz over the weekend. The Suns will hit the Bay Area over the weekend when they play the Warriors on Sunday. 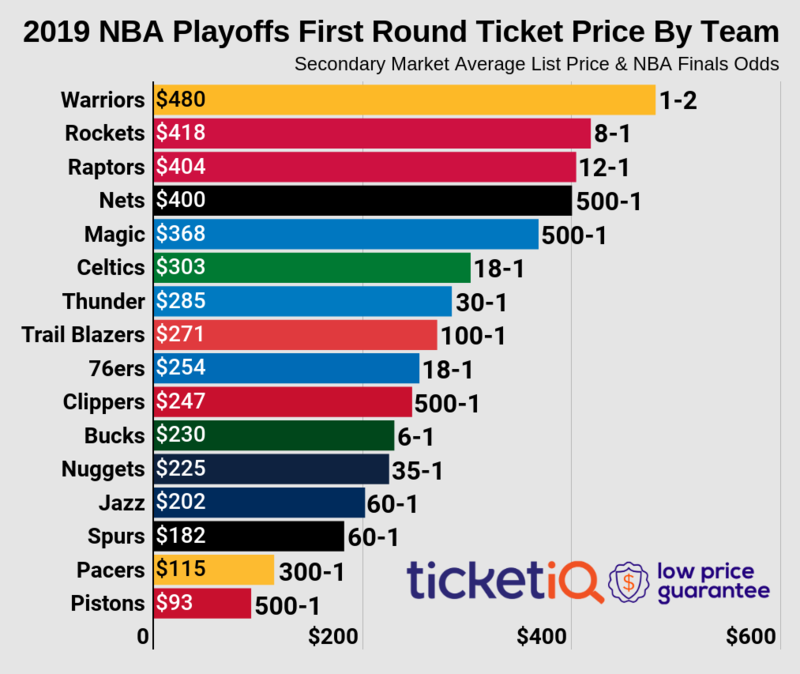 As it stands now the average resale price for Warriors vs. Jazz tickets is $254. If looking for the cheapest tickets available the get-in price is now $82 on TicketIQ. The Suns have had a difficult start to the 2016 campaign, going just 2-5 over their first seven games. Rounding out this week's most expensive NBA games list will be a mid-week battle of the boroughs between the Nets and Knicks. The Midtown Manhattan showdown will the two New York teams' first of four meetings this season. The average resale price for Knicks vs. Nets tickets at MSG is now $241 and the cheapest available tickets start from $94 each.